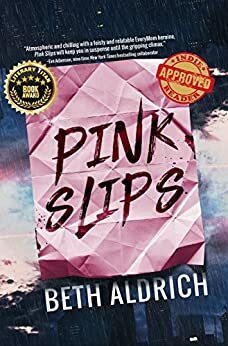 Pink Slips, an award-winning, #1 bestseller in Thrillers on Amazon Kindle and #3 overall in Kindle, is a compelling and gripping debut Suspense Thriller filled with unexpected telepathic twists that will keep you page-turning and rooting for Betsy Ryan until the early hours. Beth Aldrich is the bestselling, award-winning author of the fiction book, Pink Slips (Restoring Essence, 2017) and the non-fiction book, Real Moms Love to Eat (Penguin/NAL, 2012) and former radio, magazine publisher, and television show host and producer of For Her Information on PBS-TV, and A Balanced Life with Beth and Tracey (on Contact Talk Radio). 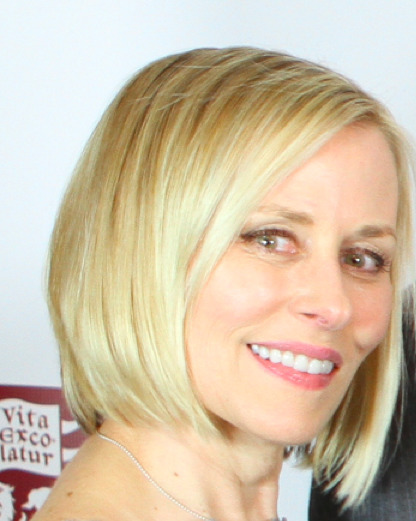 Her series ran in the U.S, Canada, Turkey, and Israel. She is a creative writer working on her debut women's suspense thriller, Pink Slips, due out summer 2017. Beth lives north of Chicago with her husband, three sons, and two dogs, Karma and Bonsai--who are always at her side when she writes. Life if full of adventures, enjoy every one! Hmm well, it's a good story to be sure, but lacks the depth of the thrilling drama it promised to be. Betsy is at best an annoying character. The author has a distinct lack of descriptive style, this could have been an amazing book, full of twists and turns, the storyline is great, but the writing is rather juvenile, the whole communicating with the dog is irritating and cringe worthy. Being able to connect to the unconscious person a great concept, but the writing is so weak it was lost. Maybe this is more suited to the younger teenage reader. I was very disappointed, I am just glad I hadn't paid for it. Psychological thriller I don't think so annoying twaddle more like! It's about a woman being stalked ...hardly, half a dozen notes left in various places. It's really about a woman who talks to her DOG and thinks it is answering her and calls her Mom! Lots of mistakes in the book e.g. Her friend drinks her coffee which miraculously turns to tea. And the repetition I got the idea of her being a chef at the first mention but it went on and on about how wonderful a cook she was and how she only buys the best foods from fancy shops for her family....luck her! I gave up as it was a boring, repetitive load of rubbish. I won't bother with anymore by this author perhaps she should stick to writing diet books. I ploughed painfully through this book, hoping it would improve. It didn't. Regardless of whether you believe in telepathy or not (I don't) there isn't a single real, believable character in this book, nor can I think of any redeeming feature whatsoever. It's complete trash. Not even the ob/gyn appointments are remotely credible. I cannot imagine anyone voluntarily attending such unprofessional medical staff. In addition, the use of stirrups and routine internal examinations at ante-natal appointments has been outdated here for decades, though perhaps this practise could be still the norm in the US. 1.0 out of 5 starsA waste of time. I have to agree with the other reviews, this was not a good book. The stalking idea could have been used to better effect. I know if I was being stalked I would not be out walking my dog on a deserted beach and giving my housekeys to several tradespeople.There was also far too much needless detail about what she ate and what she wore and how much she loved her dog. Like so many books these days, writers don't seem to want to pay for a good proof-reader, and glaring errors spoil my enjoyment considerably. The words spoken by the characters were somewhat stilted in places too. The hint at Steven's infidelity was left hanging without a proper explanation or closure. Apart from that, this story was well thought out and strung out so the denouement came as a surprise. Keep writing Beth, but for heavens sake get a decent proof reader! Very disappointing. Struggled to carry on reading it. So flimsy. This author has let herself down on this one. Sorry! Just my personal opinion. I won't be looking to read another of her books even if they are 'free'. I do appreciate having the chance to read one of hers without charge though - a free kindle book. I just won't bother if I get the offer again. Not sure I ever got to the 'i can't put it down' stage and took me a while to take every opportunity to read - other things tended to get in the way which never happens with some books that have you hooked from the first line. It is a thriller but at no point had me on the edge of my seat. An easy read though. I think the end of each chapter was cleverly written so that you wanted to start the next. However I found the plot very unrealistic and so really quite uninteresting.